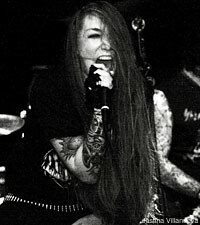 Back in September, Atakke played at New York's Europa with Howl and Toxic Holocaust. Just seven months after Noisecreep reported their show, the death metallers were on the same stage again. This time around they opened the minds and clogged the ears of Brooklynites before Castevet, Krallice and Ludicra could get on stage. Frontwoman Chloe Puke expressed to us why she was excited for the show, "Because one: It's Joanne's birthday. And two: Because Ludicra is playing. And they are, as far as I know, the best band in San Francisco. And I know 'cause I'm from there." After the band finished what Puke called a new song, someone shouted what the vocalist thought was, "That was a happy song." After much debate, it turns out the fan actually said, "That was a heavy song." "If you're a misanthrope like me, that song will make you happy," Puke answered. 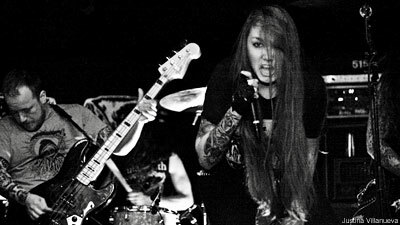 Despite having a way different stage presence from Landmine Marathon's madwoman Grace Perry, Puke and Perry have similar vocal ranges. They can do the high-pitched death scream -- and that is nothing to mess with. Atakke got to scare more New Yorkers just a couple days after their Europa show, when they played with Municipal Waste and Toxic Holocaust at The Knitting Factory. The band also has a debut studio record ready to be pushed to the masses. It has all the needed ingredients for a great record -- like engineering credits from Kylesa's Phil Cope and (of course) brutality. Be sure to check out their latest EP titled 'Avalanche' -- which Fenriz from Darkthrone called "cool as hell" in his Band of the Week blog.